It is airy but also very firm; it combines the features of glued mattresses and grates. A firm bed base or firm box spring is enough under this mattress. It is provided with unique five-thread springs that ensure high weight capacity, flexibility and comfort. This is emphasized by inserting flexible coconut-fiber board over the spring frame. The coconut layer is 3cm thick or 1, 5 cm thick, according to what mattress toughness the customer requires. The mattress is also provided with cold HR foam from both sides – thickness 3 cm and it is covered with quilted Damascus. The mattress PURE is created by pocket springs, that secure ideal spine support. Optimal for customers that like harder mattresses. The PURE mattress core is made of springs that are independently sewed in textile bags. Each pocket can individually react – so it can dynamically adapt the shape and weight load of each body part and secure optimal weight distribution of human body. 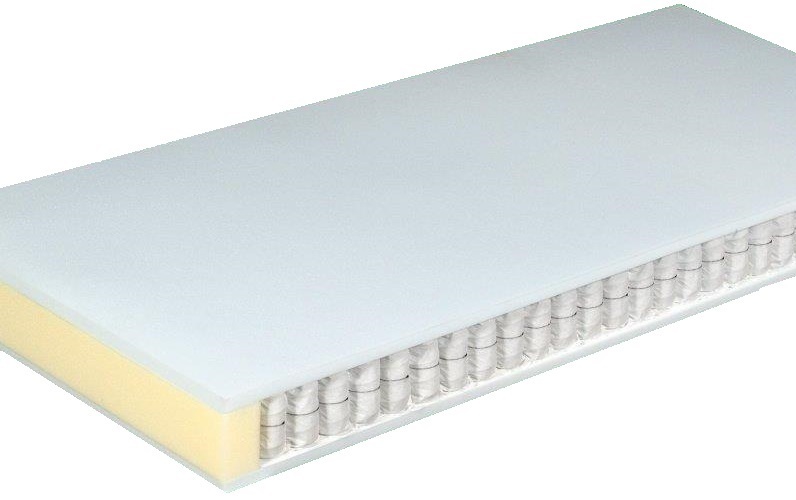 Lying areas are furnished with cold HR foam 3536 4, 5 cm /high elasticity/. Pocket mattress PURE provides ideal support of head, shoulders, trunk, hips and legs and ideal spine support. Mattress height is 22 cm with cover. Side hemming of material 3550 with high compactness. Cover made of high quality material BAMBO PES quilted by 250 gr. Fleece, 3 layers. Pocket core 5 zones, provided with protective layer VUTEX from both sides. Cover with zip, pleasantly soft that cossets every user. Weight capacity of mattress is 120 kg. Enjoy relaxation in modern style.